There is nothing quite like a really good sausage roll and seeing as I have access to amazing sausages at my local award winning butcher, I figure I can give making good ones, a decent go. Attempt number one was pretty successful. They weren’t quite as fabulous as the ones we get from Alexander’s Patisserie (if you’ve never tried them and you work nearby I highly recommend) but they were pretty damn good for a first attempt. Do you have a favourite flavour sausage roll? Mix together well – sausage meat, onion, carrot, breadcrumbs, parsley and egg. 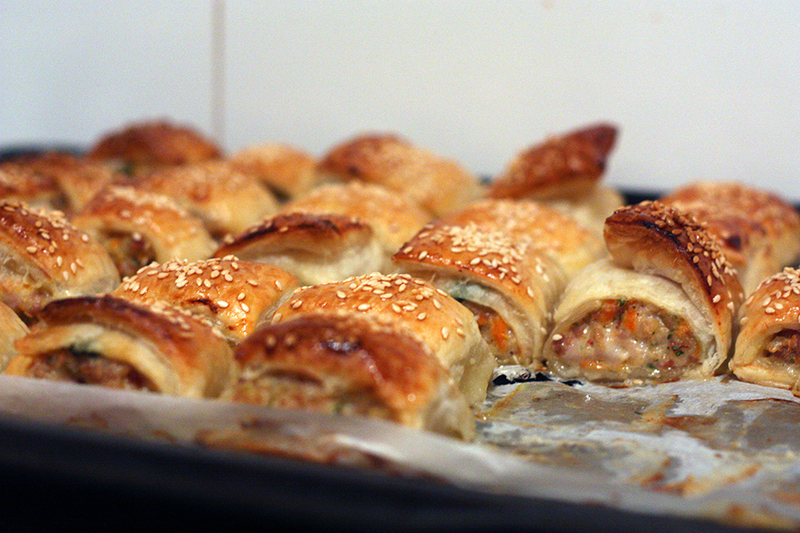 Cut pastry sheet in half, make a decent sized log of sausage roll mix lengthwise all the way to the edges. Roll lengthwise and cut into six. Bake in oven on 180ºC for about 25 minutes or until golden. I’m not sure how to improve on these so I’m just going to experiment with some different sausage meats until I’m happy with the result. Aaaaaw you just made me instantly hungry. So you mix the two type o sausage together eh? Woul never have thought of that.